I contacted Dario Valenza to have his feedback on the C-Class Hydros solution for the reversibles foils to match wind conditions as he implemented on the Paradox new rudders a similar solution. C-Class image Meredith Block. 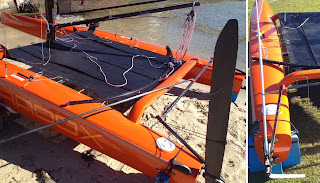 ..."Hydros C-Class reversible foils An interesting decision. 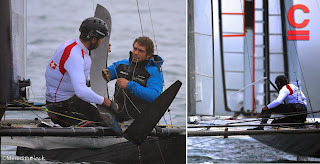 They have obviously done their numbers and decided foil lift had too high a cost in terms of drag below a certain speed. It is an alternative to leveling the 'horizontal' foil at times when heave stability can be controlled by other means. If the horizontal foil is always angled with the tip higher than the root, you always have the drag penalty from the component to leeward of foil lift - This component only being necessary when automatic heave stability is required. By contrast, Groupama has aggressive outward bend in the top of their foil so that their foil can be made 'less stable' when boat speeds are too low to fully foil or when heave can be controlled through steering/weight placement. In this mode they get some foil assistance (upward lift) without adding side force. The penalty..."